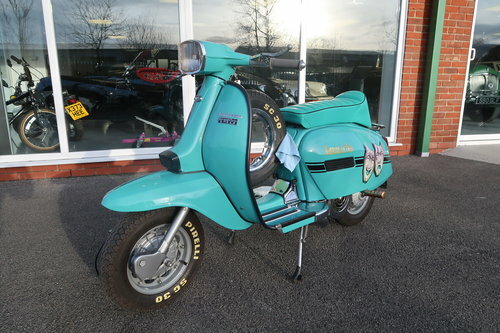 On offer is this beautiful modified Lambretta GP125 to 190cc. 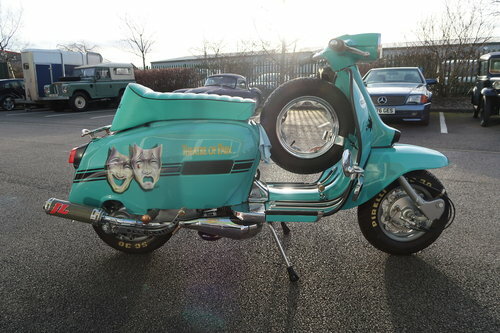 The scooter started life as a genuine Italian GP125 built in 1969. The frame numbers are correct as is the engine casing number. 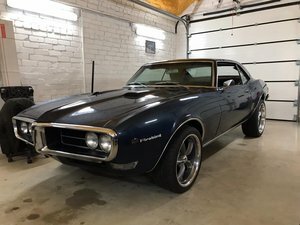 The last owner of 12 years bought the bike in stock form then soon after decided to improve it to the standard you see today with no expense spared. The work carried out was to an exceptional standard by some of the country's highest regarded specialists. With the bike is a huge file of invoices and information and below is a brief summary collated by the previous owner. 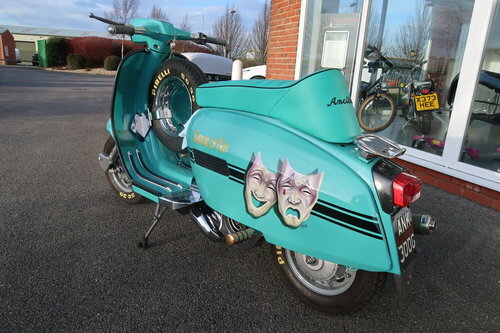 Lambretta GP190 Theatre of Pain. 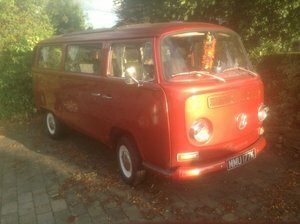 Original Registration Number, ANK 300G. original frame and engine numbers in the original colour - only the side panels have been repainted. 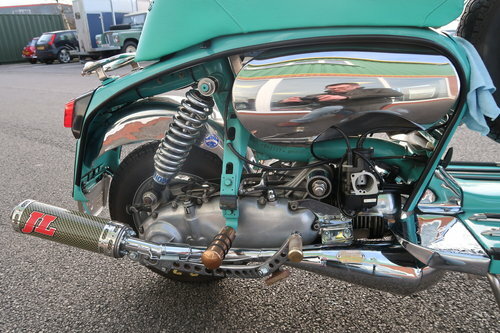 Work carried out by Cambridge Lambretta Workshops and Charlie Edmonds Performance Tuning in 2008 with only around 1,000 miles of use since. ENGINE...Reed valve Imola 190cc Race Tuned by Charlie Edmonds, many times scooter race champion from Northampton. Full Race Crank Shaft by Tino Sacchi. Readspeed 7 plate billet clutch. Milled down 30mm Dellorto Power Jet Carburetor. Full MB Developments Stainless Steel Engine Kit. Vapour Blasted Original Numbers Engine Case. Jim Lomas JL4 Race Expansion Chamber Exhaust with Carbon Fibre End Can. Chrome and Gold Plating by Quality Chrome of Hull. All engine cowlings and 4 gallon bespoke polished Stainless Steel Fuel Tank by SSP Stainless Parts. Custom Made Seat by L & N Products and also the Two Spare Wheel Covers and the Leg Shield Bra. 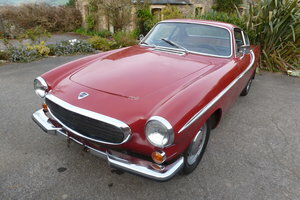 NOS Wheel Rims fitted with Pirelli SC30 Tyres including NOS Spare Wheel Carrier. Side Panels Painted and Air Brushed by Matty Evans of Messi-art. The theme being Theatre of Pain, which is a 1985 Motley Crue Album featuring a take on the Comedy and Tragedy Masks. 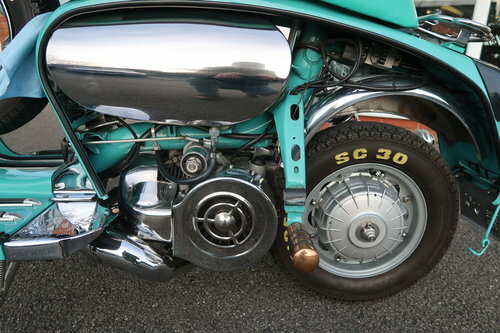 Chrome Plated Running Boards, depicting the Lambretta Innocenti Man (Ferdinando Innocenti) by the late Pete Robinson, famous for his Rhapsody and Blues 1988 and Rhapsody and Blues Reprise Scooters. Stainless Steel Rack and Bespoke Solid Bronze Rear Foot Rests and Polished Stainless Air Filter Cover by Chas Speed Fabs. Billet Steel Kick Start and bespoke Hand Machined Brass Kick Pedals by Pollock Engineering. 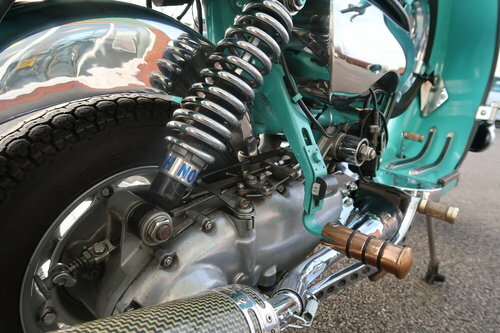 With the bike are the original parts removed from the bike when the work was carried out, These are all genuine Italian parts â€“ not Indian or aftermarket. There are also large boxes of spares including a new Aluminium Billet Hub Single Disc Brake by Frank Sanderson of Lambretta Innovations.